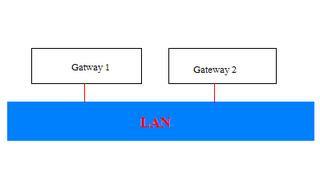 I have two gateways doing exactly the same thing - any one of them can be termed as default gateway, But now you want to split the traffic and do many more smarter things on the traffic! you want to control exactly what kind of traffic goes through which Gateway? Install Linux! I do not have special atttraction towards Linux, but Linux networking tool excel in many areas and much better than what plain vanilla windows installation give you. So thats why linux. Actually - I can assign hosts in dhcp for static routes, implement rip or igrp in my firewalls - but all that costs alot of stupid network traffic. Does not make sense to me. You are welcome to accept this solution - or - you can put your comments right here and I will get enlightened with your smart solution. Any way, lets continue with our problem. so what I did, I put another Linux Box, which decides where to send packet, logs the packet, creates the graph of which protocol being used most, how much vpn traffic, how much non - vpn traffic and its all fast, because my firewall runs on PII cpu and My Linux box runs on PIII with minimal services. And gives me alot of flexibilities. and you are there with words most advanced router sitting there, and if you are really a cisco router geek then you might want to get zebra and start using that! Damn the router and fiewall and can we have some more entertaining stuff like mindless creativity? I came here hoping to find something entertaining. If these kind of posts continue, I'll stop visiting. Gateway is spelt wrong in the diagram. Please correct. And who are you to decide to tell him to decide what he should decide to do. So stuff yourself. "screw you dude, who are you decided what should be on this blog. Let him decide and stuff you..."
Sorry to be creative, but I think it should be "who are you TO DECIDE what should be on this blog"
World is what you see around!